Susana Moreira Marques’s unique and quietly devastating book follows death as it goes about its grim work in the rugged and isolated wine growing region of Planalto Mirandês, Trás-os-Montes, in the north eastern corner of Portugal. The region is so remote that some of its inhabitants speak their own language, Mirandese, which recently gained co-official status with Portuguese despite having fewer than 5,000 native speakers. (One of my prize possessions is a rare copy of Asterix the Gaul in Mirandese.) If Manoel de Oliveira, the master of Portuguese cinema who died last spring at the age of 106, had re-made Deliverance – now there’s a thought – it would have been set in Trás-os-Montes, the Appalachia of western Iberia. The area has long been considered culturally backward, and still suffers from a degree of prejudice in Portugal. The journey inland from Porto along the Douro River to Trás-os-Montes, however, is said to be spectacular. Beyond its insights about mortality, Marques’s book left me with a lingering impression of the place: abandoned villages, olive groves and orchards, austere beauty and a brutal honesty about life and death. Now and at the Hour of our Death seems an unlikely success story. Marques, a Lisbon-based journalist born in Porto, shadowed a home palliative care unit for five months in 2011, interviewing the dying and their families and writing up a kind of ethnography of the experience. It took a leap of the imagination to write such a book at all; even after the leap was made, it could have been something drab and dutiful. Instead Marques has written a restless, formally experimental book – translated with beautiful subtlety by Julia Sanches – that also manages to convey the emotions she experienced on her journey. She describes her travels in the region with characteristic honesty: it is ‘the journey no healthy person wants to take’. Her role is almost sacrificial, in the sense that the journey she ostensibly takes for her readers does not leave the author unscathed. Death hangs over every minute of our lives; usually we choose to ignore it. Spending days or weeks with a book like this may not sound like everyone’s cup of tea, and at times it can be difficult. All the deaths in the book are cancer deaths. (This is a country where most people still smoke and eat fatty pork at least one meal a day.) Many of us know people who have died from cancer. As Marques writes: ‘Any resemblance between these characters and real people is no mere coincidence … it is highly likely you know someone in the same situation.’ Having watched my own father die from cancer when he was a few years older than I am now, I know that it is a pretty grim sight. On the other hand, death deserves our attention. In the role of the dying, or the family or friends of the dying, we will be there soon enough; we might as well look it in the face. Marques’s book is dark, but it is also life affirming – in the same way that being in the presence of death gives the healthy person an odd feeling of vitality, even exuberance. At the end of the road is a village from which the children have disappeared. And at the end of another road, another village from which the children have disappeared. Throughout the house are paintings, saints, flags from far-flung countries. She has never left the village. Her children traveled once they’d grown up. Her husband also traveled, spending most of their marriage abroad. I kept reminding myself as I read the book: this too is Europe, Europe now, as much as Berlin or Paris or Brussels is Europe. To paraphrase William Gibson, it’s just not evenly distributed. This unevenness is seen in the contrast between an illiterate dying generation, raised in poverty and ignorance under the Salazar dictatorship, and the grandchildren sitting at their bedside, who grew up in the boom times of EU expansion and development funds before austerity made its dramatic return. It is seen in the portrait of the Virgin Mary hung over the operating theatre door, and in the promise of a patient to donate a hundred euros in her name if his operation goes well. Marques is an outsider to this world, but she finds its way of life addictive: ‘I would want to go back over and over … to recover what, in my world (the center? ), seemed to have been lost’. The italicized words of the dying and their families are shockingly blunt on death and other subjects. There is the darkest Portuguese humour in Elisa’s description of the undertakers taking away her father’s body: ‘the man, he brought in a coffin, but the first coffin was too small and so he was standing around there, with my dad . . . Then they went to get another coffin’. They end up prying her father’s body out of one coffin and dropping it into another as she watches in horror. Then there is the old man, João, who has harsh words for his country as he looks back on his life. He and his wife recount their life’s adventure, moving to Angola to farm in the 1960s and then returning after decolonization, and he is bitterly critical of Portugal’s colonial history. Far from looking at the past through rose-tinted glasses, he says of himself and his own people: ‘it was us who was on their land . . . It was sickening. Them folks went there to set a bad example. And they paid for it with their lives . . . And they deserved no less.’ Seamlessly weaving together personal stories from remote villages with larger historical events is another of the author’s impressive tricks. One of the questions the book seems to ask is: How will you tell the story of your life, at the end? What will it sound like? What will you say, assuming you are lucky or unlucky enough to know that death is coming, and you have time to prepare, and people around you who will listen and keep you company in the growing darkness? I grew up, things were bad at home; I left for another country but it didn’t work out; I came back, got married, had a couple of kids. And Other Stories manages to find and publish some fascinatingly sparse and haunting books. Another example is Yuri Herrera’s Signs Preceding the End of the World, which describes border crossings and liminal states of another kind. There seems to be a growing appetite among readers for a pared down, almost acetic writing style. It is a haven from the experience of being online: the endless chatter, feeding of insatiable desires, trips down rabbit holes. I read the first half of Now and at the Hour of our Death in the mountains on the rural north side of the Portuguese island of Madeira. When I walked down into the nearest village I saw hardly any people, and even fewer under fifty. It seemed a strange comparison, given the fact that Madeira is called the ‘pearl of the Atlantic’ and the remote region described in this book is as far from the sea as any place in Portugal. But then I read the line where Marques describes Trás-os-Montes as ‘An island, but instead of sea, land’ – and I realized that the comparison was not so unwarranted after all. Susana Moreira Marques – is a writer and journalist. She was born in Oporto in 1976 and now lives in Lisbon. Having worked as a journalist since 2004, she now writes pieces for Público and Jornal de Negócios. Susana lived in London in between 2005 and 2010, where she was part of the BBC World Service while also working as a correspondent for Portuguese newspaper Público. Her pieces have been awarded several journalism prizes, namely the Prémio AMI — Jornalismo Contra a Indiferença, and the Human Rights Award by the UNESCO National Commission. 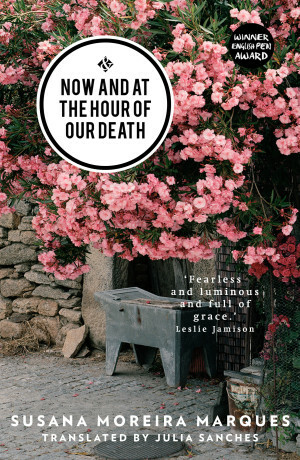 Agora e Na Hora da Nossa Morte (Now and at the Hour of our Death) is her first book. Julia Sanches – Brazilian by birth, Julia Sanches has lived in the United States, Mexico, Switzerland, Scotland and Catalonia. She obtained her undergraduate degree in Philosophy and English Literature from the University of Edinburgh and has a masters in Comparative Literature and Literary Translation from Universitat Pompeu Fabra. Her translations have appeared in Suelta, The Washington Review, Asymptote, Two Lines and Revista Machado, amongst others. Posted in Book reviews and tagged mortality, now and at the hour of our death, susana moreira marques. Bookmark the permalink.